This is the last article in a six-part series on styles and strategies used by T20 teams around the world. Also in the series: the six-hitting team, the bowling team, the batting team, the spin team and the cautious starters. 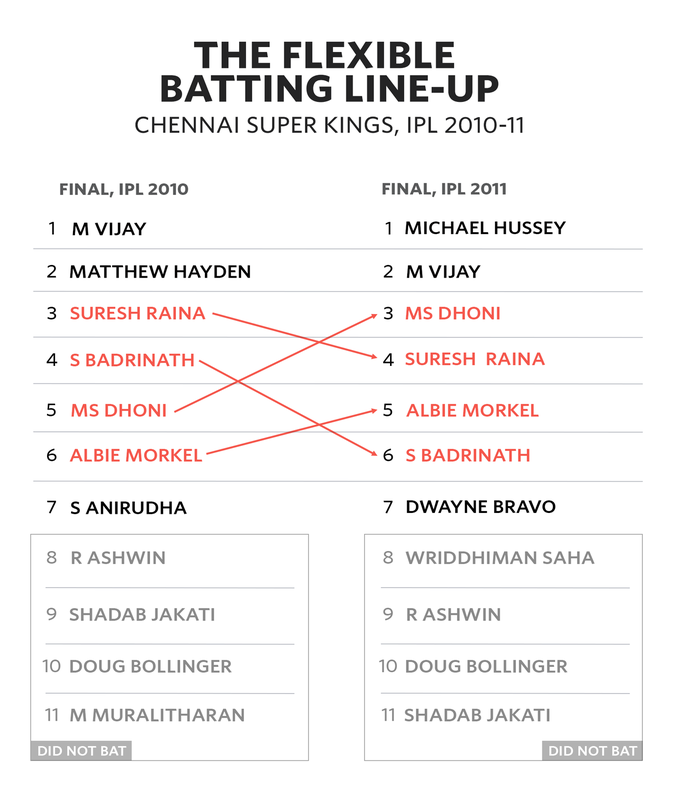 The Chennai Super Kings team of the early 2010s was among the first T20 sides to think in terms of roles rather than set positions. Below a solid opening pair (M Vijay and either Matthew Hayden or Mike Hussey), a series of allrounders (Albie Morkel, MS Dhoni and then Dwayne Bravo) could bat anywhere in the middle order. Their positions would depend on the feel of the side, the match situation, the opportunity to capitalise on a particularly short boundary or to exploit a favourable match-up. In the victory in the 2010 IPL final, Dhoni came in at No. 5 and Morkel No. 6; when Chennai retained the title a year later, Dhoni batted at No. 3 and Morkel at No. 5. Sometimes both would bat lower; on other occasions Morkel would bat above Dhoni. S Badrinath, a classical player with a modest T20 strike rate, was also used adroitly. If Chennai lost early wickets, Badrinath would come in early and often make crucial contributions. He walked in at 27 for 2 in a winner-takes-all league match in 2010, making 53; and at 1 for 2 in the 2012 elimination final, making 47. Otherwise he would bat lower down - he batted No. 7 ten times for Chennai, and No. 8 twice. Remarkably for a specialist batsman, Badrinath did not bat in 32 of his 114 games for Chennai. It was no indictment of his worth; just a reflection that the circumstances did not call for his specific talents. If CSK were pioneers in embracing flexibility, Islamabad United have taken it to the next level. 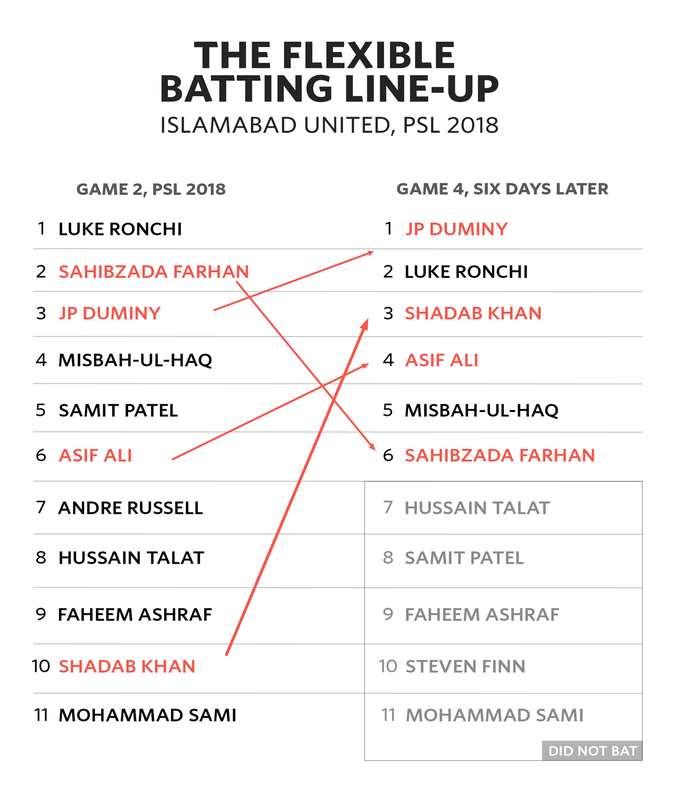 To Islamabad the notion of a batting order is archaic. "We look at situations," says Hassan Cheema, the Islamabad manager. "There are no batting numbers." Fluid batting orders are a growing trend in T20, but no side has taken it to the extreme that Islamabad has. They don't just adopt middle-order flexibility, as CSK successfully did, but extend it to the top three and the lower order. A batsman's position on the team sheet is merely the basis for negotiation. Anyone can be moved based on insights gleaned from statistics, observations of how the game is evolving, or simple gut feel. At Islamabad, Andre Russell has been used as an opener and at No. 8. JP Duminy, a middle-order player, was pushed up to open in 2018, to his surprise - but adapted well. Hussain Talat has batted between Nos. 3 and 8; Asif Ali from opener to No. 8; Sahibzada Farhan from opener to No. 6. In a game last season, Shadab Khan batted at No. 10; six days later, he batted at No. 3 - one of six No. 3s Islamabad used in 12 games in 2018. Before the season, players were told that they would have to cast off ideas about their optimal roles for the greater good. "We were all prepared to do whatever was asked of us, even if it wasn't our usual role somewhere else," explains Luke Ronchi, Islamabad's keeper-batsman and Player of the Tournament in the victorious 2018 campaign - the team's second title in the first three Pakistan Super League seasons. The dynamic batting order reflected Cheema's belief that "old-school thinking is, you go with specialists. In bowling you have to, but if you have a deep batting line-up, your batsmen don't need to be elite." Islamabad adopt a similar - albeit less pronounced - flexibility with the ball, prioritising the most advantageous match-ups. With several allrounders in their team, they always have abundant options. They used six or more bowlers in 11 of their 12 games last season, and deployed bowlers at different times, depending on which opposing players are batting when. "Your bowling plan must simply be what the batsman doesn't want - nothing more complicated than that," Cheema says. "So if we have somebody like Darren Sammy batting then we will either bowl him spin, or if it's pace bowling then it has to be at length or a bouncer. Don't bowl yorkers to him because that's what his technique is geared towards." Islamabad's style amounts to a vision of a team calibrated on the runs and wickets each player can bring, and when they are best suited to doing so in any given match, rather than traditional notions of batsmen and bowlers. If old-fashioned certainty - about when a batsmen or bowler will enter the fray - is sacrificed, they believe that role clarity derives from how a player must play, not when they bat or bowl. And flexibility makes a side harder to plan for, since their opponents are never sure what they will confront next. Basketball is embracing "positionless basketball", with fluid players interchanging seamlessly and adjusting to any role when required. 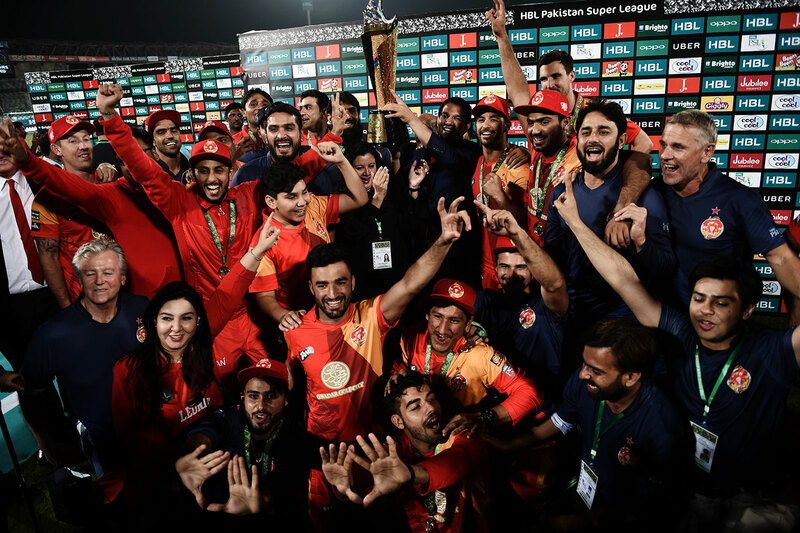 Islamabad United are a glimpse of a positionless T20 cricket future, in which teams approach matches with no preconceived notion of how to best utilise their players. Many sides, of course, fulfil several of the categorisations listed in this six-part series; no two T20 teams are stylistically the same, and all borrow different facets from different styles. Still, the contrasts in T20 strategy run deep, and have been concealed by the rather simplistic common depiction of the sport, although this may be belatedly changing. In the years ahead, two paths to team-building seem plausible. 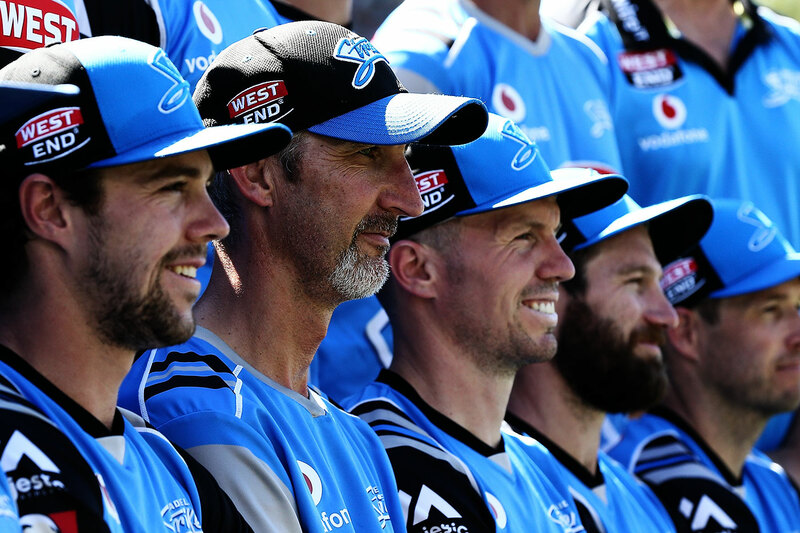 In the first, T20 styles may become more pronounced, with specific coaches - like Jason Gillespie, Tom Moody or the Knight Riders backroom team - associated with a particular style of play. This would create more conspicuous contrasts, and fascinating tactical divergences between teams. For instance, AR Srikkanth, the Knight Riders analyst, envisages that, "In the future some teams will emerge where two sets of death bowlers will play in T20. The first set will bowl in the Powerplay and the second in the back end of the innings. We're not too far away from that." A second path is for specific traits to become almost universally favoured. Based on what has been successful recently, this could entail a higher proportion of spin bowled, a greater emphasis on bowling in general, and batting line-ups focusing on boundary-hitters so that the entire top order would essentially bat in the same way. Yet if there were to be a universally accepted optimal way of playing T20 - a little like some believe has become detectable in the NBA recently, with teams focusing on three-point shots and two-point shots from near the basket, and marginalising mid-range two-point shots - then it would lead to a sport with less stylistic and tactical diversity. If this would not be desirable, it is not likely either. The divergence in conditions and players around the world precludes any perfect, universal strategy. As the sport evolves, so will a rich lineage of contrasting tactics. Over the past 15 years T20 has made the leap from frivolous entertainment to serious sport. Now it is time for the next leap - for it to be embraced as a sport with the same strategic nuances as basketball, football, or indeed, Test cricket.